A route that offers you everything! 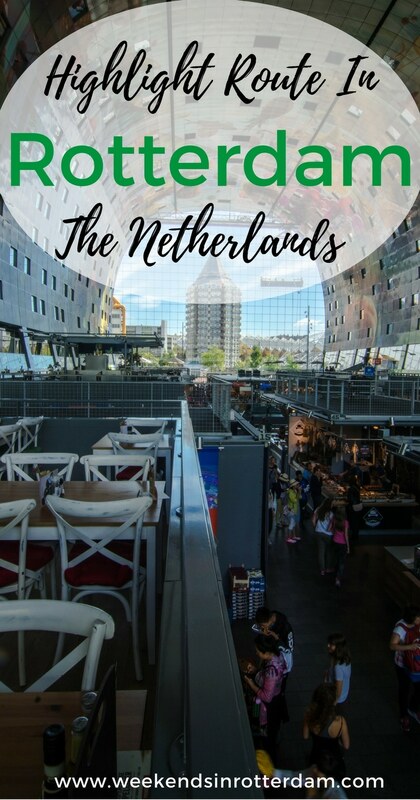 In the highlights of Rotterdam route you will find the places that really stand out in the city and characterize Rotterdam. 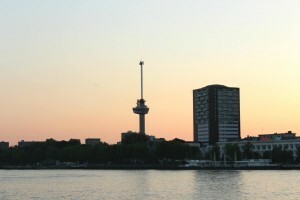 Below is an overview of the places you must see when you are in Rotterdam. We recommend following this route by foot as some places are not accessible to cyclists or cars. In addition, parts of this route can be easily followed by public transport, as all parts of the city are well-connected. This will save you some time (and energy). Are you coming by car? Then be sure to check out our article about parking in Rotterdam. Blaak is our starting point and at the same time an important highlight of the city. Here you will find the Markthal, which is filled with nice restaurants and is famous for its unique design. Also, your eyes will soon fall on the well-known yellow Cube Houses. You can admire the inside for €2.50. There is also the option to stay here for the night at the StayOkay Hostel. Furthermore, you will find the building “The Pencil”, the Laurenskerk (church), and there is a big market on Tuesday and Saturday. From Blaak onwards we continue the route by following the Hoogstraat (with the Laurenskerk on the right and the Markthal on the left). This street ends at our next destination: the Koopgoot. The Koopgoot, whose official name is Beurstraverse, is filled with more than 40 stores. Via the Koopgoot you avoid the busy Coolsingel. When leaving the Koopgoot, you enter the street called the Lijnbaan. 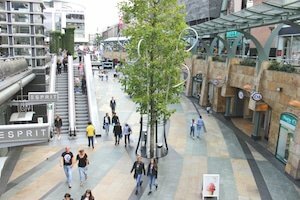 We have now arrived at the Lijnbaan, one of Rotterdam’s largest shopping streets. To get to our next location, turn right (the street at Burger King). If you’re a shopping lover, stroll around the different shops that are located here. 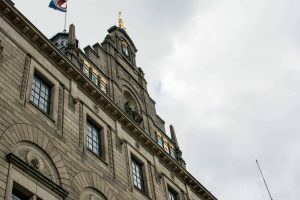 Would you rather go straight to the City Hall? Then continue following the street and turn right at Stadhuisplein (next to the Bershka and Pull and Bear). This way you’ll stand face to face to the Rotterdam City Hall! Food & drinks: Markthal, Happy Italy, Fish market, Little V, Vapiano, Very Italian Pizza. Food & drinks: Hema, Bijenkorf, Raoul lunchcafé, Staal Rotterdam. Food & drinks: Cornelis, Café Plein, Amigo, McDonald’s. Our next location is a lively and artistic street filled with nice cafes, shops, art galleries and restaurants. From the City Hall, you can either take the metro for one stop or walk a few minutes. 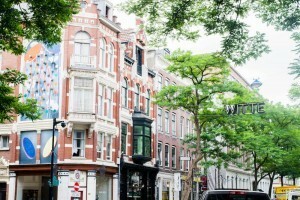 The Witte de Withstraat is the ideal place for a snack or a drink. Don’t forget to look up when walking this street, as there are many nice wall paintings. Finished exploring and had something to eat at the Witte de Withstraat? Let’s continue to the next stop. If you’re wearing your sneakers, then it’s doable to walk from the Witte de Withstraat to the Erasmus Bridge. If not, an option is to take the metro at Beurs. Depending on which side of the bridge you want to visit, stop at Leuvehaven or Wilhelminaplein. We recommend staying at the center-side (Leuvehaven), considering the next destination. Between Beurs and Leuvehaven is just one stop with the metro! The Erasmus Bridge – also called the Swan – is the icon of Rotterdam. The bridge connects the northern and southern part of the city and is 800 meters long. 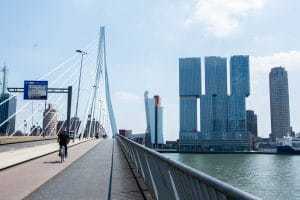 Definitely recommended to walk up the bridge for a nice view of the skyline of Rotterdam. Next up: the Euromast! Perhaps you have already seen it when walking on the Erasmus bridge, but this icon is definitely worth to admire from up close. We recommend using the subway. 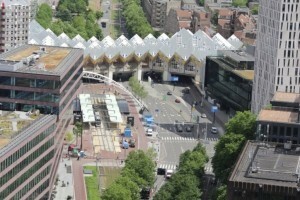 Get in the metro at Leuvehaven and get out one stop further at station Beurs. Here you have to transfer. Take metro line A towards Schiedam Centrum. After a few minutes you reach Coolhaven Metro Station. It is 11 minute walk from here. Do you want a beautiful view of the whole city? Then we recommend entering the Euromast. The entrance costs €9.75 which takes you all the way to the top. Food & drinks: Hotel Bazar, Oliva, Warung Mini, Hamburg, Supermercado, Ter Marsch & Co, Frietboutique. A beautiful route to fill your day and with which you are sure you’ve covered every big highlight in the city. Of course, you can also start halfway through the route, walk it from back to front, or cut it up in parts. And if you cannot find a street, feel free to ask people around you. A true Rotterdammer knows exactly where the highlights are! For your ease we have also included a map below. Aah I absolutely love Rotterdam. Your list reminded me of my time there 2 years ago. My favorite was watching the sun go down from the many cafes near Erasmus bridge overlooking the river.